Echoleft | Charity event software & online fundraising. Bring people together, build closer relationships, raise more money. Echoleft is a tool that helps you bring your fundraising and your events together in one place. When we're running events, I want to spend less time doing admin and more time building relationships with supporters. Manage events of all shapes and sizes. Registration & ticketing for your events. Sell tickets and event registrations for your events, designed for charities and good causes. Individual and groups/teams and all built-in including paying registration fees. Create a branded web page for every event in just a few moments and easily link to it from your own website. Your supporters can create a fundraising page during the booking process, with your event details already filled in, making accepting donations and collecting sponsorship even easier. Create custom registration forms for every event, letting you ask participants for everything you need, saving time and money. Attendees can update their registration information at any time, making it easier for you to support them. Discover more about how we help with your events. Fundraising pages that tell a story. 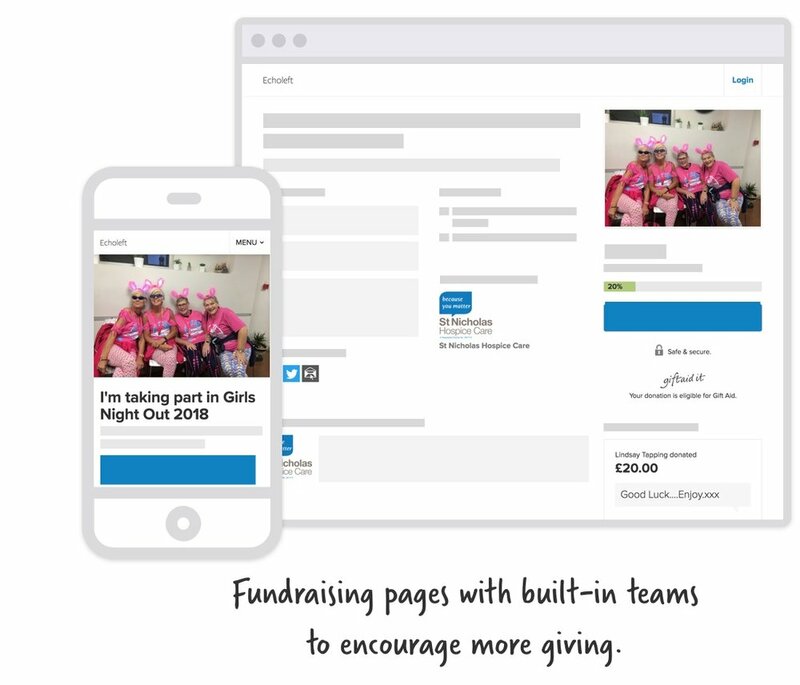 Your supporters can set up fundraising pages including targets, offline totals, details of their events, photos and more. Our fundraising pages are designed to be familiar to both fundraisers and donors. Fundraising pages created when people are signing up for your events are automatically branded. That means your event's logo and branding extend quickly on to social media and beyond. When raising money in memory of a loved one, fundraising pages can easily be linked with one of our memorial websites, so every in-memory donation becomes part of a larger fundraising story that is designed to last. Ready to do more with online giving? Great, let's start a conversation! We're excited to hear what you want to achieve. Even if you're researching and planning, our team are a great resource. Thanks for taking the time send us a message. One of our team will be in touch as soon as we can, we’re excited to talk to you! Memorials that connect with your cause. Memorial websites that allow friends and family to add photos, tell stories and accept contributions from others. Privacy and security are built in. Every memorial comes with a tribute fund and fundraising tools, allowing you to open up a conversation about donations and legacy giving. We've helped in-memory giving campaigns to grow from a £1,000 target to over £50,000 raised. Our fundraising pages and event management features are also integrated, making in-memory fundraising more accessible than ever. We're really proud to work with some wonderful causes. We provide online giving and enable event tickets and registrations for some great causes that are doing some incredible work. 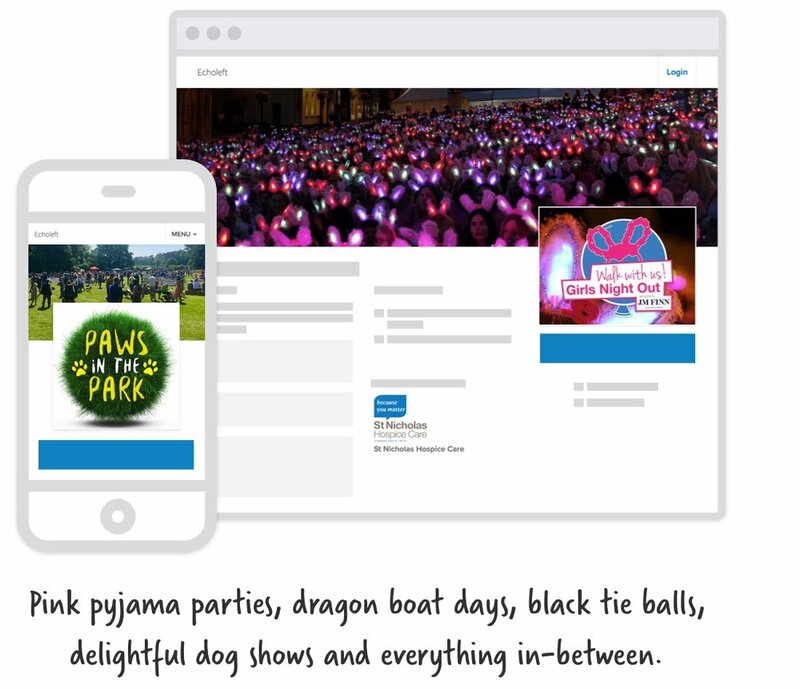 Whether we're helping 2,000 women don their pyjamas and flashing bunny ears for Girls Night Out, or powering team registration and fundraising for Ipswich Dragon Boat Festival dragon-boat race through a crowded marina, we're proud to be provide tools that help your team achieve great things. More features for fundraisers like you. We're always working hard to discover what your team needs. Making the technical seem easy. Running Events, fundraising campaigns and in-memory websites can often mean integrating events software, donation platforms and creating new pages on your own website. We provide a ready-to-use solution which means you can focus on your events. It's important when using a third-party service that your donors and supporters recognise your branding and feel safe and comfortable. As well as your logo, every organised event can include customised profile photos and cover photos where you can brand their experience. Donations go directly to you. We use Stripe to process donations, which means they go straight from your donors to you. We don't store, or hold your donations. In fact, we never touch them at all. Whenever a supporter donates, or registers for an organised event, you can provide a customised set of terms and conditions to make sure that your data protection, health and safety and other legal responsibilities are available to them without needing to link them to an external website. Clear and simple privacy controls are combined with built-in security features, including encryption. You can be confident that your supporters are using modern, secure software. Your donations can be exported as a CSV, making it easy to view in Microsoft Excel, to import into any other software you use, or to keep for your own audit history. Donors and fundraisers have clear, straightforward personal data options to make their information available to you. The software and tools you choose are really important. They impact on your ability to reach the goals you put in place for you and your team. As people that build software, we take that responsibility very seriously. Let's start a conversation about how we can help you do more with your event and online fundraising. We're excited to talk to you.